The Torrent Vichy Shower System is designed for the ultimate combination of rain shower and high pressure massage. 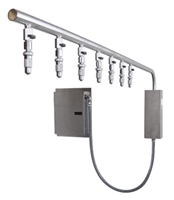 The Vichy rain bar provides seven individually adjustable shower heads that allow spa clients to receive a relaxing and therapeutic water treatment. The attached high pressure Scots Hose allows you to give an invigorating tissue massage with adjustments in intensity. A variety of treatments are possible with the Torrent system including hydrotherapy, body polishing, body wraps, circulation massage, pressure point massage and skin toning. 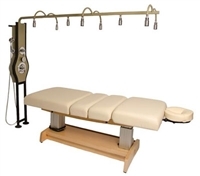 The Torrent is the only shower of its kind that allows the massage therapist to walk all the way around the table. Our system offers the most accurate temperature control, seven adjustable shower heads and the most simple operation. The Typhoon Vichy Shower is an excellent way to offer the maximum Vichy Shower experience with utilizing seven shower-heads. The guest will be completely relaxed and invigorated with the ward effect of the Vichy experience. The Typhoon allows the technician to swivel the shower arm out of the way or may choose to use it to enhance the experience for the Vichy guest. With features such as seven self-cleaning shower heads, the most accurate thermostatic mixing valve available, and durable stainless steel construction, the Typhoon will provide years of trouble free service with a timeless, elegant design. Shower Box: 28" x 24" x 15". Shower Arm: 85" x 24" x 6". Scots Hose included, not pictured. Not only does the Brass Monkey provide a relaxing downpour on the body, it also has a “Cold-Plunge” built right into the system. Simply turn the “cold-plunge” knob for a truly invigorating experience. Features six fail-proof, self-cleaning shower heads, a “Cold-Plunge” knob for easy to use operation, utilizes the most accurate thermostatic mixing valve available, cabinet and shower arm are powder coated with a brass finish, built-in hand shower for augmenting treatments and easy clean up and volume controls on shower heads turn completely off. No dripping. 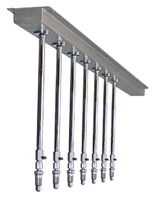 Featuring a swinging stainless steel rain bar that is 84” long (allowing for complete coverage of the guest below), seven spray adjustable showerheads that rotate for maximum coverage and have individual volume controls from full spray all the way to positive shut-off. The control panel has a High-Flo pressure-balancing mixing valve with anti-scald protection that provides a safe, comfortable experience by maintaining a proportioned mix of hot and cold water for any desired temperature. The ¾” valves and supply lines provide maximum water flow. The temperature gauge allows the technician to maintain just the right temperature of water. The adjustable hand shower allows the opportunity for augmenting treatments and is also a great tool for product clean-up on the guest. 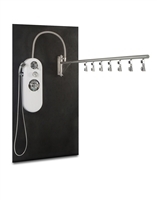 The VaVoom 8 headed shower arm has 6 arched shower heads and 2 shower heads on the rain bar. This gives a total body coverage from every angle providing an invigorating and relaxing Vichy experience. These showerheads infuse oxygen into the stream. Not only that, but they will never clog. That’s right, never clog. It gets better. They also use up to 40% less water than typical showerheads. The VaVoom was also designed so that it can be installed in any existing wet room, perfect for replacing your Vichy Shower if it is out-dated or in disrepair. Can be powder-coated to match spa colors/decor. (Upgraded charged may apply based on color selected.) Table pictured, not included. This Swiss Shower delivers one of the most invigorating water massages a person could ever experience. It is hand-made and the quality is maintained with all commercial, stainless steel and solid brass components. Includes a mixing valve box and shower heads. Pipes and plumbing supplies by others.